​Feb 9, 2019 - am - Feb 10, 2019 16:30 hrs - Power was restored to the West grid - Evens #34 to 116 and Odds 95 to 133. Dec 20, 2018 13:30 hrs - Dec 22, 2018 17:02 hrs - Property owners who have been absent should be aware that the SE grid (East of #34 to South of #91) was without power for the period noted. Fridge/freezer contents should be checked carefully. Piers Island is less than one square mile in area, located between Colburne Passage and Satellite Channel, near Sidney, BC and the Swartz Bay Ferry terminal on Vancouver Island, BC. It is a 911 community. 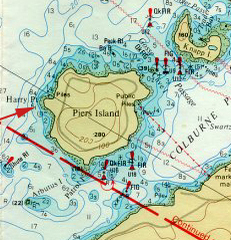 Owners of island properties also belong to the Piers Island Association which caters to some social activities for islanders, arranges work parties for stewardship of the centre of the island and invasive species irradication. Island wildlife includes an excellent migratory and resident bird population, black tailed deer, river otter, mink, newts and Pacific Tree frogs. All but 3 properties are waterfront, ranging from walk on beachfront, to high bank waterfront. Electric golf carts have proven an excellent source of transportation on the island, as well as old fashioned foot travel and bicycle. While there are no stores, hospitals or schools on the island, the town of Sidney is only 5-10 minutes by boat and has all the amenities one might desire. There is a group run private ferry service (Eco Cruising BC) taking residents from Piers Island to Swartz Bay government dock or Canoe Cove Marina. Water taxi service is also available by private charter with Eco Cruising BC. The Piers Island Improvement District (PIID) governs and attends to the day to day operation of the water distribution system, volunteer fire department and parking/launch property located on Dolphin Road, in North Saanich. Drinking water is supplied by the GVWD via North Saanich with some re-chlorination treatment on island by water operators for safety. Electrical power is supplied by BC Hydro, telephone by Telus and high speed ADSL internet also available, although speeds are somewhat slower than Vancouver Island. Piers also falls within the jurisdiction of Islands Trust and the Capital Regional District for taxation, building permits and other governance issues. Piers Island also falls within the jurisdiction of Islands Trust and the Capital Regional District for taxation dealing with a number of issues such as harbours, libraries, building permits and emergency services to name a few. CRD - Building permits, other bylaws such as pets/leashes etc.